LOCATED IN West Africa, the Niger River stretches 2,610 mi (4,200 km) in length, making it the thirdlongest river in Africa, after the NILE and the CONGO. It is ranked 14th among the longest rivers in the world. The drainage basin of the river encompasses 807,000 square mi (2,090,000 square km). The Niger River runs in a long crescent from GUINEA to MALI, right up to the edge of the SAHARA DESERT, before heading south to the Gulf of Guinea. The unusual course of the river mystified Europeans for many years. The Europeans thought that the section of the river near Timbuktu was part of the Nile River. By the early 17th century, Europeans thought that the river flowed west and joined the Senegal River. Finally, in 1795, Mungo Park became the first European to describe the upper river. While local people knew the actual course of the Niger, Westerners knew about it only through a series of explorations late in the 19th century. The source of the river rises in the Fouta Djallon Highlands at a point near the border between Guinea and SIERRA LEONE, 150 mi (241 km) from the Atlantic coast. The main source of the Niger River is called the Tembi River. Away from the source but within Guinea, several tributaries join and replenish the Niger. From then on, the Niger traverses the interior plateau in a northeast direction toward the Malian border. As the Niger crosses the border between Guinea and MALI, other rivers such as the Fie join the main channel of water near Kangare, Mali. 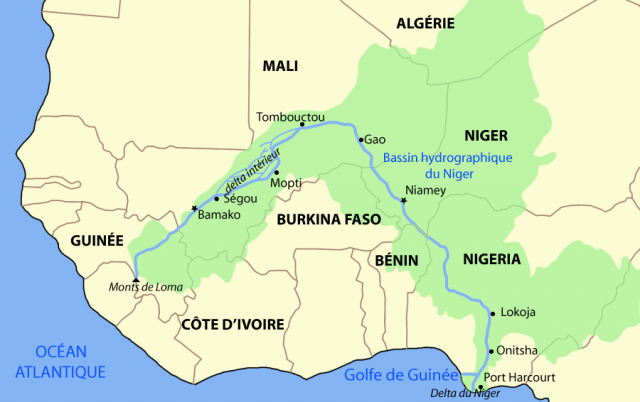 Thereafter, the Niger flows northeasterly until it reaches the interior delta in Mali. In the interior the Niger is joined by the Bani River, often regarded as among the important tributaries of the Niger. The Bani River is 696 mi (1,120 km) long and has its source in CÔTE D’IVOIRE and BURKINA FASO. The Niger is precious to life in Mali. It provides fish, drinking water, and water for farming. It also represents a major means of transportation in Mali, particularly in some of the remote areas in the country. From this interior delta, the river flows in a northeast direction before turning to the southeast to form the great bend. From this point on the Niger slowly meanders in the arid areas in proximity of Gao (a great center of trade and education during the Mali and Songhai ancient civilizations) and enters the country of NIGER. While flowing through the country, Niger River is joined by several tributaries such as the Faroul, Dargol, Sirba, Garoubi, and Tapoa. The Niger River then continues and forms the boundary between the Republic of Niger and BENIN. This part of the Niger receives the Mekrou, a tributary from Benin. Thereafter, the river enters the Federal Republic of NIGERIA, where the Benue River joins to create an important confluence of the two rivers at Lokoja in Nigeria. From the confluence with the Benue, the Niger heads southward and discharges through a massive delta into the Gulf of Guinea or the ATLANTIC OCEAN.